Children may further augment their knowledge on place values in hundreds after they had picked up the basics of identifying place values in tens and ones. 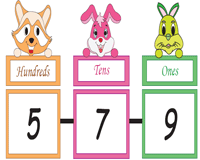 Laminate this array of exclusively designed stunning place value posters and employ our poster templates to suit your learning/teaching needs. 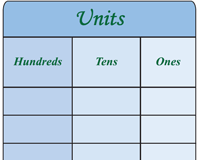 Use the download option to obtain the complete set of place value charts on this page. 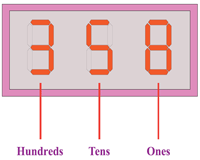 Teach students to read and identify the correct place values of the three-digit numbers displayed here. They are sure to love this chart that features furry animals holding up placards! 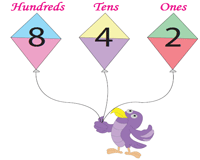 Print and pin up this captivating kite-themed chart at home or in school to help learners grasp the concept of place values up to hundreds place. This poster serves as a perfect instructional aid. Laminate or enclose this digital ticker poster in a sheet protector. Use it as a reference in the classroom to assist students recall place values in the hundreds. This color and monochrome blank charts make for a perfect homework assignment! 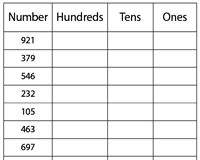 Give them a series of whole numbers and get them to write the place value for every digit in the appropriate columns. Print and circulate this set of worksheets to assess a learner's comprehension on place values up to hundreds. For every number featured here, list out the number of hundreds, tens, or ones it contains.